Hitman: Codename 47 is a revolutionary third-person action adventure that combines a strong mix of stealth, strategy and shooting. Taking control of a ‘Hitman’, the player has to carry out ‘hits’ on a number of high-powered adversaries all set within intricately detailed 3D environments. You must enter the mind of a genetically engineered assassin Codename 47, whose deadly efficiency is now needed more than ever. Lured back into a global ring of deception, you must kill not only to make a living, but to continue living. This time it's not just business. It's personal. Sensing that he may be the next target, Agent 47 travels to America, where he prepares to Make a Killing. 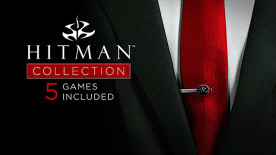 Hitman: Blood Money places gamers once again in the role of the world´s greatest assassin, Agent 47. Get ready to pull the trigger on a completely new chapter in the award-winning Hitman series. Be the ultimate assassin in the Hitman Sniper Challenge by testing your reactions, focus and skill in a stand-alone hit. Unlock weapons and upgrades that can be carried over into HITMAN: ABSOLUTION and compare your scores with other players around the globe using online leaderboards.